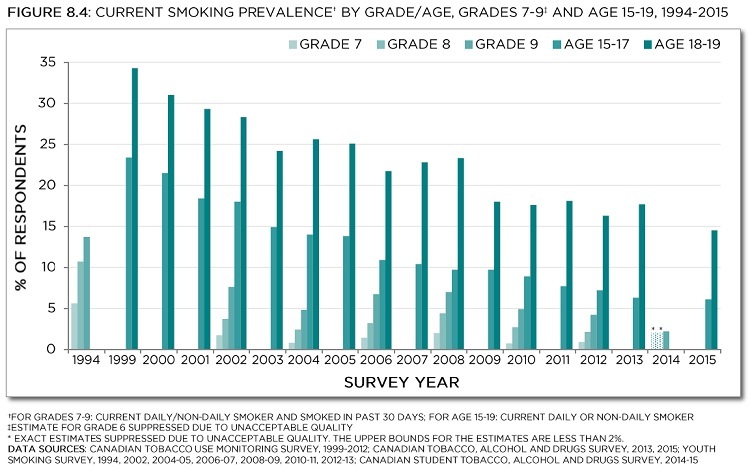 Smoking prevalence appeared to increase with age: rates were too low to report among grade 6 students, but increased to 17.7% of 19-year-olds (Figure 8.3). As noted, data up to grade 9 is provided by CSTADS, and data from CTADS is used for older youth. There may be some overlap in coverage between grade 9 students and 15-year-olds. Among students in grades 7-9, smoking patterns by grade were fairly consistent between 2002 and 2014-15, and prevalence was much lower in these years than in 1994 (Figure 8.4). Over time, smoking among youth aged 15-17 declined fairly steadily overall, although there was little change in the most recent waves. Among 18- and 19-year-olds, smoking also declined overall, but less consistently, and levelling off in recent years (Figure 8.4). This has led to a greater difference in smoking rates between older and younger adolescents: in 2015, the smoking rate among 18- and 19-year-olds was more than double that of 15- to 17-year-olds. *Exact estimate suppressed due to unacceptable quality. The upper bounds for the estimates are less than 2%. 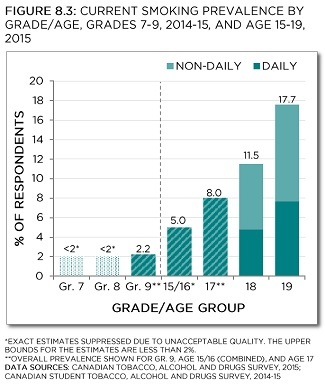 **Overall prevalence shown for grade 9, age 15/16 (combined), and age 17. Data sources: Canadian Tobacco, Alcohol and Drugs Survey, 2015; Canadian Student Tobacco, Alcohol and Drugs Survey, 2014-2015. *For grades 7-9: current daily/non-daily smoker and smoked in past 30 days; for age 15-19: current daily or non-daily smoker. **Estimate for grade 6 suppressed due to unacceptable quality. ***Exact estimates suppressed due to unacceptable quality. The upper bounds for the estimates are less than 2%. Data sources: Canadian Tobacco Use Monitoring Survey (CTUMS), 1999-2012; Canadian Tobacco, Alcohol and Drugs Survey (CTADS), 2013, 2015; Youth Smoking Survey (YSS), 1994, 2002, 2004-05, 2006-07, 2008-09, 2010-11, 2012-13; Canadian Student Tobacco, Alcohol and Drugs Survey (CSTADS), 2014-15.